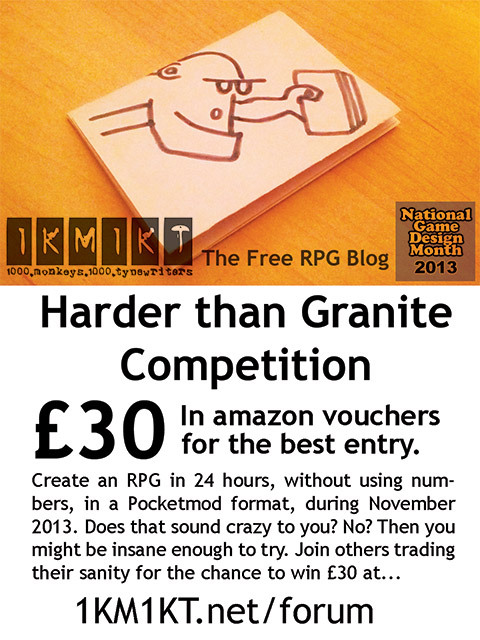 Welcome to the 2013 24 Hour RPG Granite Hard Competition! Hosted at 1KM1KT and sponsored by The Free RPG Blog. 1. Write a roleplaying game without numbers. Find out more about what on Earth a Pocketmod is here. 3. Spend 24 hours writing a roleplaying game during November. 5. Upload your game to 1KM1KT by 00:00 (GMT) 1st December 2013. 7. 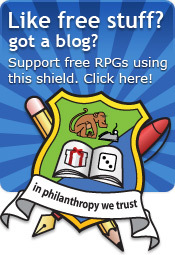 Check back on 1st of January 2014 to find out who the winner is, or check on The Free RPG Blog. 8. You can use more than one Pocketmod booklet but kudos will go to those with a complete game in the fewest. Innovative: Is it a clever use of the small space? Attractive: Is it pleasant to look at? Extras: Did they include actual cover, index, character sheet or any other cool things you get in a proper RPG? Yes, even in a Pocketmod! That's a shame, we might run another competition soon. If you wrote a 24 hour RPG but didn't get it in before 00:00 GMT 1st December 2013 then we'd still like to see it. Enjoyed it so much that you want another go? Are you bonkers? Yes? Then please do! Have another go. Enter as many times as you like! I'm not paying for the therapy you might need at the end of it, though. Please do! Submit what you did in 24 hours and then please do keep going. You won't get any feedback on the extended game from the judges until after the competition but there are plenty of others on 1KM1KT who can help. Can we write and submit in October, or November only? Hello! Good question. It's only in November, I'm afraid. You can practise, and play with some themes but the game itself should only be written in a single 24 hour period in November. When you said without numbers does this mean no printed numbers on the pocketmod or no number at all (any kind of arithmetic, this mean no dice, no counters or token...) ? Hi Stab, it's a good question. Go as far as you can without numbers. We're really talking about arithmetic here. We're avoiding the vast number of die based mechanics that are stat + mod < target number. Hey Stab, we don't mind if English is not A+! We have lots of Monkeys on 1KM1KT for whom English is not their first language and they submit some great games. As long as we get the idea of the game, that's all we judge on.